We've reached the end of our free Block of the Month programme, 'Consider the Lilies'! 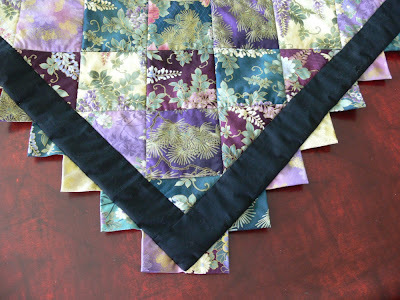 Today I am giving you the rest of Block 4 and instructions for putting it together and finishing it off as a wall quilt. 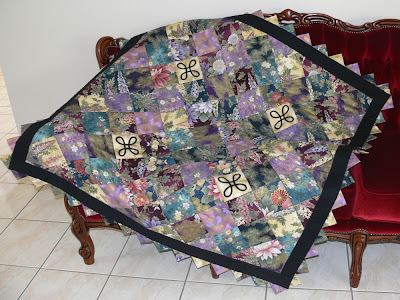 My quilt was hung on one of our walls yesterday, just on a bit of dowel at the moment, but I have ordered a lovely black 'scrolly' hanger which I think will really show off the quilt. Not many websites stock these hangers as large as 80 cm, so it took a bit of looking around to find what I wanted. Now I'm eager to hear the postman's knock! 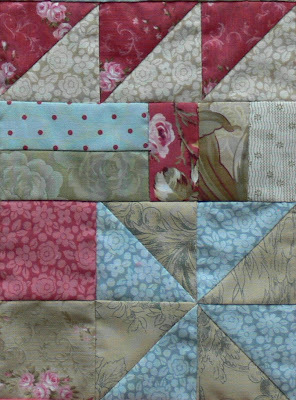 I hand-quilted the whole quilt. It took a while, but I am always much happier with my hand-quilting than my machine efforts! All the patterns will remain for free download until 31st December, so make sure you tell your friends. Well, this last week was a much more productive one - much better than the previous three or four! I was beginning to wonder whether I'd ever get back into my usual frenetic pace! The assembly line went into full production and I managed to actually get some projects completed! Woo hoo! I made a gift, completed a sewing set and have started on some appliance covers. My Butterscotch and Roses fabric has arrived, so I hope to get started on a new project next week. I love buying fabric ranges, but it brings its own problems! It's a bit like a child in a well-stocked lolly shop, not knowing which one to choose! There are so many lovely fabrics that it takes me ages to work out which ones I will use for applique, which ones I will keep for borders, how many I will include in the sashings, what binding I will use. Oh the joys of designing!!!! As you know, I don't make many large quilts as I'm not big on piecing. However, when I bought an irresistible range of oriental fabrics, they were crying out to be made into a quilt. It is a very simple one to show off the gorgeous beauty of those fabrics. You can find it in the current issue of Australian Country Craft and Decorating, Vol 23 No 2. If you missed it, you can find the tutorial here. Don't forget to send me photos of any of my projects you happen to make. I love seeing your interpretation of my designs. 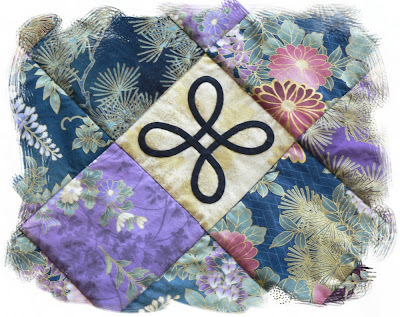 Val, your finished Consider the Lilies quilt is absolutely beautiful. Love those colours. I love your oriental quilt as well. Thank you for sharing these wonderful quilts with us. Consider the Lillies is absolutly gorgeous, I love the finished quilt! Thank you for sharing your talents with us. Oriental Twist is also beautiful, it really showcases the fabrics and the celtic knots add a wonderful touch. Have a wonderful day! It's a wonderful quilt!! Thanks so much for sharing. 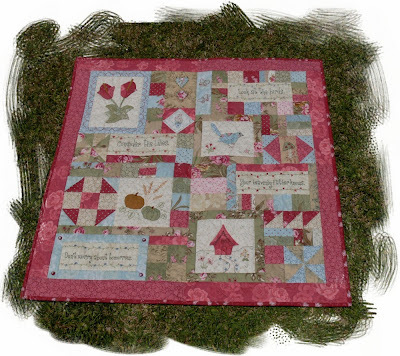 Thank you so much, darling Val, for this gorgeous pattern! This is one of my very favorites EVER. And you are so generous to share it, thank you! 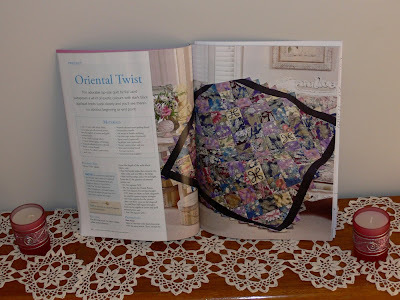 Your Oriental Twist is stunning - I have a bunch of oriental fabrics that I'm not sure what to do with, I'll have to look for the magazine! Val, as ever your work is gorgeous, just beautiful. Butterscotch and Roses is gorgeous, I'm very jealous you're getting some! The oriental fabrics are awesome. 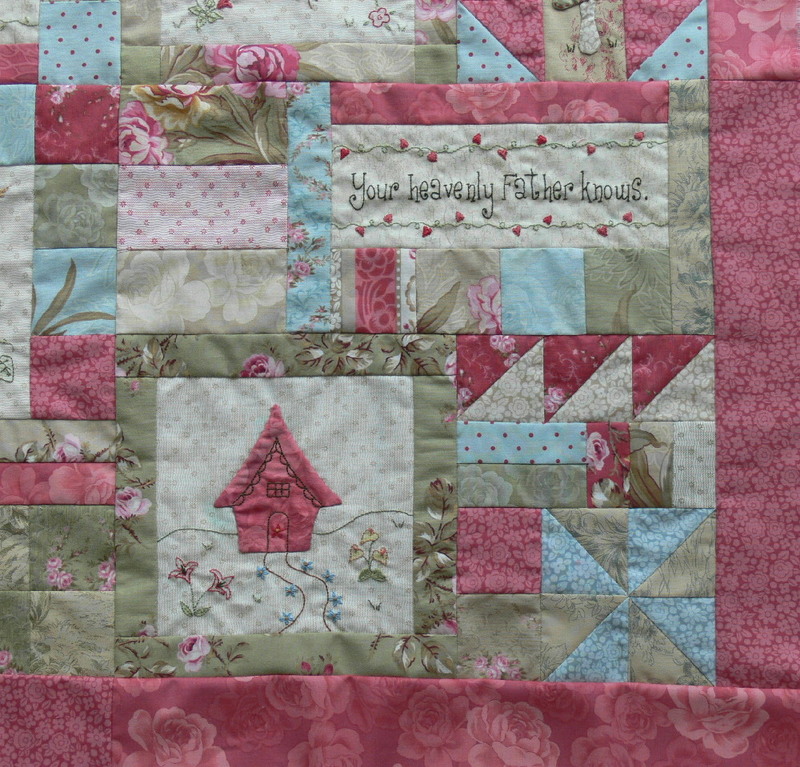 I found a online quiltshop here in Holland with it last weekend. Some of the fabrics you used i recognise. I did not know what to make from it... maybe your pattern. First of all, finish the lilies. Thank you so much for this lovely BOM. I downloaded the latest 2 patterns today. I have been in Spain for 3 weeks and now I have to follow up on all things. Appliqué is not my favorit but I hope some day to come to a point where I like it. Your quilt looks so fantastic.